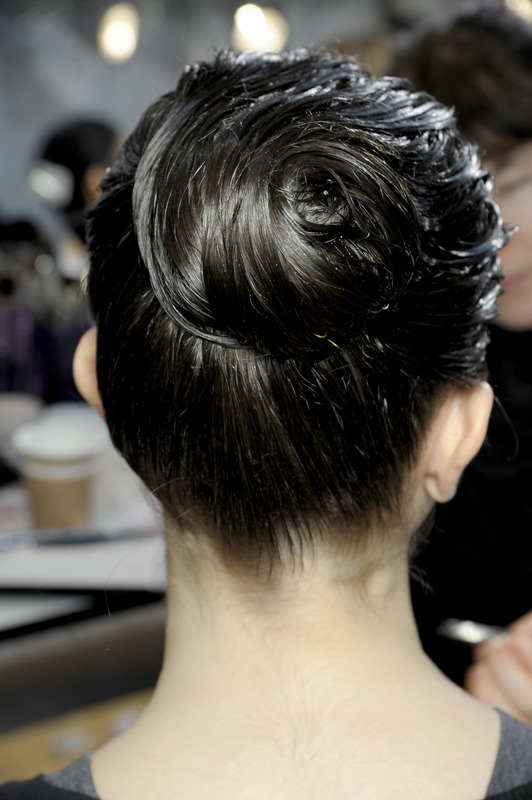 Redken Creative Consultant Guido created a slick chignon for the Fall 2013 Christian Dior show. The hairstyle had a hint of1950’s, but the wet-looking finish took it from mod to modern, helping to define the more refined looks we’ve been seeing from Christian Dior with Raf Simons now at the helm. 1. Apply guts 10 root targeted volume spray foam to damp hair section by section from roots to end. 2. Partially blow-dry only the front section of the hair, pulling up from the roots with your fingers as you dry to give the style height at the crown. Leave the lengths of the hair damp and continue to style. 3. Using your fingers, part hair slightly off-center with your fingers. 4. Take the top section of the hair that you blow-dried and clip off to the side. 5. Gather the rest of the hair into a high ponytail, secure with an elastic, and then twist into small chignon, pinning flat to the head as you twist. 6. Unclip the front section and separate into two on the left and right side of the part. Pull the left section back into the chignon wrapping it around and pinning as you go. Repeat with the right-side section. For the first time ever viewers will be able to ‘customize the catwalk’ giving users the ability to change the colour of selected key looks and accessories and share them the moment they hit the runway or order them instantly with delivery 3 months ahead of industry lead times. The whole experience is built around allowing viewers to personalize the show and share those moments with their friends. Everything from the music to the clothes to the beauty can be purchased and shared across every platform, channel and device. Topshop partnered with facebook’s in house engineers to develop ‘shoot the show’ a camera button placed on the corner of the live-stream and on demand version will allow users to click and capture their favorite looks from the show as if they were sitting in the front row, effortlessly enabling the content to reach hundreds of millions of people. Additionally all the beauty products used on the Topshop Unique girl will be available to buy immediately with delivery in 48 hours alongside styling tips and tutorials replicating the experience of our physical instore nail bars digitally. Music will be available to download on topshop.com from itunes both during and after the show. For those who follow us on twitter @Topshop is challenging fans to review the collection in 140 characters on the day, in what it has branded the ‘Tweet off’. The best tweet will be chosen with the winner given vip tickets to the next show. All tweets will be broadcast live on topshop.com. Emerging British designer Misha Vaidya of By Misha unveiled her Spring/Summer 2013 collection “Wishing Well” in presentation at a whimsical garden tea party. Models’ were transformed into stems as flowing chiffon, satin and brocade in shades of honeysuckle, mint, marmalade and crème brûlée mirrored the delicate petals of flowers. The twelve-piece collection was shown on models spread across four platforms, all placed in front of floor to ceiling windows at Alvin Ailey American Dance Theater. This provided an opportunity to truly see the design as well as the quality of materials used. How refreshing to see a designer – a young designer whose finger is on the youthful-pulse of her audience. Misha’s designs weren’t so “adult” as to look like she was trying too hard, nor to “young” that wouldn’t appeal to young ladies from 18-30. These were outfits that were wearable and fun. If you are a young bride, there is one dress in the collection that is called “White Rose” that is simply beautiful. The Cream full-length fitted strapless gown shows off your curves. It has a curved satin top and low scooped back. The sequin waist band, adds just enough sparkle and it’s beautiful layered chiffon detailing adds to it’s chic appeal. Misha offers romantically sophisticated couture women swear. Wishing Well is the most recent of Misha’s three collections, keeping with her brand’s niche of whimsical, feminine designs complimented by understated grace. By Misha will be available for purchase now on ByMisha.com and I Like What You’re Wearing. Ok….So I’m not one to tell you what you should wear for your wedding but I’d hope…you might have second thoughts if the designer’s most famous customer was…Lady Gaga. Lady Mary Charteris (the “Lady” connection) a 24-year-old aristocrat decided that instead of choosing a traditional bridal gown she would have her gown designed just for her. Pam Hogg, a designer for Lady Gaga designed the cutaway detailed sheer sleeved top with tulle skirt, floral headpiece and yes, even her shoes. This dress certainly assured that all eyes were on the bride when she married Robbie Furze, front-man of The Big Pink. In addition Ms. Hogg designed couple’s bridemaids and pageboy attire, who were also dressed in unusual blue outfits that featured capes and floral headpieces. Hmmm, I love those wild and crazy Brits. Pam is holding the dress so it doesn’t get dirty before she says “I do”. Would you wear something like this?? Rei Kawakubo’s cryptic clue for her new Comme des Garçons collection “White drama” was exactly what the show was. It tracked a progression through life’s dramatic way stations: birth, marriage, death and transcendence. In most traditions, “white” is considered the color associated with all of life’s moments. Some were as obvious: the duchesse satin for a wedding dress or the lace of a christening gown or the white flowers covering as if it were a death shroud. In this case for Kawakubo his primary focus was bridal. No matter this collection was interesting and truly a state of mind. How interesting that some see marriage as a birth of a new life, while others see it as a death…of their past. No matter, Rei Kawakubo’s 2012 show provided some interesting elements; a cape, the white boots, perhaps the veils that a very modern bride might find interesting and would be bold enough to wear. Couturier Suzie Turner started her own business at 17 and quickly became known within the industry; with her insistence on only the finest fabrics from the farthest corners of the globe gaining her notoriety for never settling for second best. Much of Suzie Turner’s work is unique in process as well as original in style, her head strong self-taught creativity has led her to challenge convention and develop techniques absolutely exclusive to the house of Suzie Turner. All of Suzie’s work is timeless, not only does it inspire and enhance a sense of self and style that is wholly personal to the client but also holds an unquestionable longevity within any collection and is equally at home at red carpet event’s in Los Angeles or New York runway as it is gracing life’s personal adventures and explorations. Her exquisite bridal gowns and outfits for special occasions range from intimate private functions, to red carpet events. When a design force dies, it’s easy to see how the collection can die a slow death. What you need is a strong and talented right-hand to step in, take the reigns and continue to move forward. Enter Sarah Burton, the creative director of Alexander McQueen, a woman who isn’t running away from the pressure-she is in fact, racing towards it. This Fall 2011 collection had strong Elizabethan influences. Ruffle accents and leather paneling, to furs and feathers to whimsical plumes of lace. You got the feeling that there was a new “Queen” in the house and she was doing it her way, while keeping true to the brand. Some have speculated that if Alexander McQueen had been alive, he might not have designed Duchess Catherine’s now famous gown. If you were lucky enough to enjoy the McQueen exhibit in NYC, I think this might be true. His clothes, even those that had a ‘fairy-quality’ to them…were ‘heavy and ‘dark.’ His reputation was being a true rebel and his clothes reflected. Regardless, Sarah may have officially burst onto the scene, known as the ‘designer to Catherine’, but I say that she has talent and these dresses are befitting the Princess bride that you are. Hmmm…I’m beginning to hear rumor that Sarah will have a bridal division. If these designs are any indication, I’m sure it will be a smashing success.